Professor Angela Hatton has today begun her new role as Director of Science & Technology at the National Oceanography Centre. Angela is a microbial biogeochemist with interests in the role microorganisms play in the production and removal of environmentally significant trace gases. She was previously Director of Research at the Scottish Association for Marine Science (SAMS) and had also held research positions at SAMS and the University of East Anglia where she achieved two Natural Environment Research Council (NERC) Fellowships and obtained her PhD. Angela has participated in numerous seagoing research expeditions as part of international scientific programmes including OMEX, LOIS, ESCAPE and DISCO as well as field based studies in both the Arctic and Antarctic. Professor Hatton has contributed to the strategic planning of important collaborative science programmes, including serving on steering committees or advisory groups for the UK Surface Ocean Lower Atmosphere (SOLAS) Programme, the UK National Ocean Acidification Programme, and on programme integration team for the Quantifying and Estimating the Earth System (QUEST) Programme. 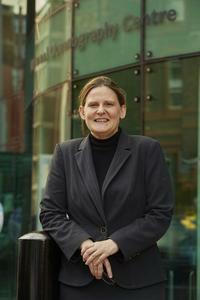 Angela was elected a Fellow of Royal Society of Biology in 2014 and is currently Chair of NERC’s Science Board.